Paying for college or university is a real worry for many students. Thankfully there are many scholarship programs out there that can help you. However, they can be just as hard to get as getting into the best colleges to study. You will need to apply and your statement of purpose for scholarship will be an important if not vital part of that application. It is not, however, the same as writing a statement of purpose for MBA application. It has a very different focus. When you are applying to college your statement of purpose is very much focused on how well you fit the subject area and the course that they are offering. For a scholarship, it is much more focused on showing that you meet the organizational objectives of the body offering the scholarship. This means even more need to ensure that your SoP for scholarship is tailored precisely to the application. If you have read our application for scholarship sample then you will have already seen the level of writing that is going to be required of you to impress the committee. Our professional help and writing advice that we detail here will help you with ensuring that your SoP for scholarship will be of the right standard. Are you looking for the perfect SoP for scholarship? If so, then our professional statement of purpose writing service will deliver one to you in no time! What Types of Scholarships Can You Apply To? Athletic scholarships: these are scholarships that are specifically aimed at those students that excel at particular sports. These are excellent even for those students that may not excel academically but have an excellent sporting record. Academic scholarships: these are very much for those students that are high performers academically. They can be awarded for performance across subject areas or for a particular field. Average performance scholarships: these are rarer than academic scholarships but target those students that may have an average level of performance academically. However, they usually look for those that have applied themselves with their extracurricular activities in some way. Minority scholarships: these are provided to members of specific racial or religious groups especially is they are particularly under-represented. Scholarships for women: these are usually targeted for particular subject areas in which women are under-represented such as within engineering. That being said there are often scholarships for almost any subject if you look. Creative scholarships: these are similar to athletic and academic scholarships but are aimed at those students that excel within the arts in some way. Community service scholarships: these programs are there to reward those students that have been active in giving back to their communities. Unusual scholarships: these can be given for almost any reason and are often the hardest to find and apply for. How Should Your Statement of Purpose for Scholarship Be Written? How to write statement of purpose for scholarship or statement of purpose for Masters in engineering? The first thing to consider when writing a statement of purpose for scholarship is what do they want? Each scholarship has its own goals and requirements and you need to ensure that you meet them before you get to work. Most also have their own expectations as to how your statement of purpose for a scholarship application should be written. Thankfully most will detail out clearly what they expect and will even provide you with SoP for scholarship samples and examples of those that won awards. What are your goals academically and career wise: explain the subject areas in which you will study and why you have chosen them. Where will this take you in your future career? Why should they invest in you? What is it about you that makes you unique and worthy of their scholarship fund? How do you meet their specific requirements for providing scholarship. How will you give back once you have achieved your academic goals? Many will expect you to show how you will provide back to the community if you are provided support. Introduction: provide the reader with a brief introduction of who you are and why you are seeking a scholarship. Body paragraph 1: outline your academic goals and what subject areas you are seeking to study and where. Body paragraph 2: show how you meet their specific requirements for the awarding of a scholarship and why you, in particular, deserve the award. Body paragraph 3: explain what gaining the award will mean to you. Conclusions: summarize and show how it will support you following your long term employment goals and how it will enable you to give back to the community in some way. We will ensure you submit the best SoP for scholarship with your application! Look at a relevant statement of purpose scholarship sample: often the awarding body will publish the statements written by successful applicants so these are a great source of information and inspiration. However, they are not something that you should even consider copying. You are unique and so should your scholarship SoP be. Never copy a statement of purpose for scholarship application sample as it will never get you the award you are targeting. Target the scholarship with care: review what they are looking for from those that they award to. Look carefully at their requirements and ensure that it is reflected within your writing. Not only that, use the same language that they use within their writing and reflect those same keywords within your writing. Open with a bang: your first line must make them sit up and think. They just want to read more to see just where you are going to take them within your scholarship SoP. The more impressive the opening line the more chance you have of the rest of your statement being memorable. Outline your scholarship SoP writing before you start: there are many things that you need to cover so creating an outline will help ensure that you don’t miss anything of importance. It will also help your writing go much more smoothly. Be concise and to the point with your writing: avoid meaningless or unsupported statements within your writing. You must ensure that every word counts and is relevant to getting you the financial award that you are seeking. Once you have completed your statement of purpose scholarship don’t forget to get feedback. Carefully review your writing and be prepared to revise your writing several times. Never submit your scholarship SoP without careful proofreading as simple mistakes can be enough to see your award going to another. Our statement of purpose help will put you in touch with a professional writer that fully understands how the scholarship application and award process works. This will give you a real advantage over the other applicants and help you to gain the award that you need. We can help with writing statements, providing strong endorsements through effective letters of recommendation and all of the other documents you may be required to supply. We can write the statements of purpose of all the types and with the different word count. We follow the format and all the instructions. The SoPs are edited as many times as the clients want. We also rectify the sentence structures and vocabulary to make it flawless. The misspelled words are rectified from our editors in the SoPs. They even change irrelevant words and replace them with the right ones. Replacing the wrong phrases and words is not a challenging task for us. If you are done with searching for the best SoP writing help, then we can help you for this regard. Our group of writers and editors are proficient and able to construct the admission documents you always looked for. SoP: Our team works on different types of SoPs i.e. 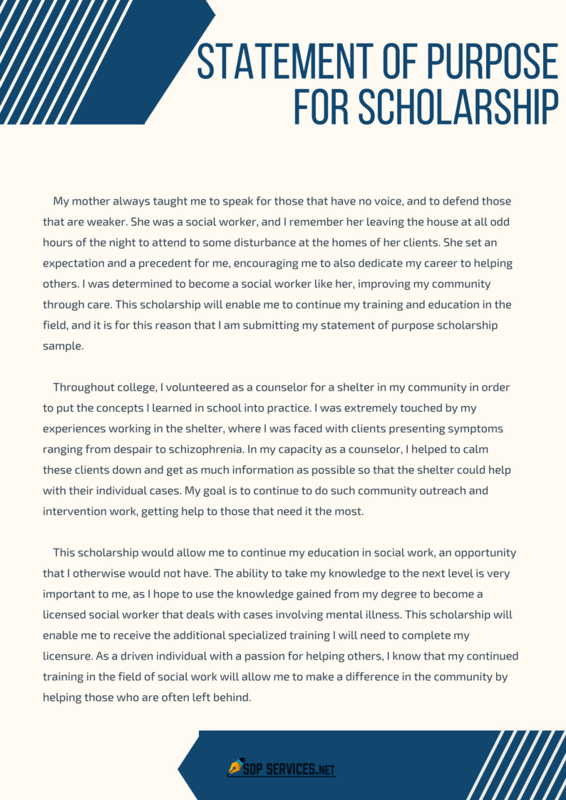 statement of purpose for scholarship. You just have to provide the proper instructions. Letter of Intent: The authors are expert in composing the best letters of intent. Such letters are crafted by keeping the most recent examples and formats in consideration. Scholarship Essay: Our writers know about how to write statement of purpose for scholarship. They can make it more valuable and worth to approve. Resume: Your job application writing is not a problem anymore. We can tackle this task in the best way. Before getting the services, you are welcome to ask for statement of purpose for scholarship sample. We will provide you the unique and modern SoP for scholarship samples to choose for your assignment. You need to follow the simple process for placing the order. Only unique writing: your SoP for scholarship samples are written with you from scratch to reflect you as the individual that you are. There is never any copying and you will receive a plagiarism report with your statement. Error free: not only do you work with highly skilled and experienced writers your work will be thoroughly checked through our free proofreading. On time delivery so that you will not miss your submission deadline: our experts are never late to the agreed deadline. Guaranteed satisfaction with your scholarship SoP or we will give you your money back. Get noticed with a statement of purpose for scholarship application written with our highly skilled and effective writing experts!